Posted: Wed Jan 20, 2016 11:59 pm Author: JamesJMH91 Post subject: What killed DoND? With 'Deal' finally approaching the end of it's run, I have looked back on the good times in the show, but I've also seen comment over the years about how the show has become too silly, boring or annoying. But what do you think was the main thing that caused DoND to go downhill? Posted: Thu Jan 21, 2016 1:08 am Author: American Coupon Boy Post subject: Re: What killed DoND? Definitely the show expanding to 1 hour was the main recipe for disaster. It made a lot of games with 11 and 8 box Deals naturally boring and drawn out, thus the show feeling the need to introduce all of these gimmicks to pad games out. I saw Jen's game live today and it felt as dull as a dishwasher thanks to all of the needed padding. Posted: Thu Jan 21, 2016 1:54 am Author: Aaron Brock Post subject: Re: What killed DoND? If you'd have asked me half a decade ago when I stopped watching it would have been things such as sob stories and silly behaviour. Those actually seem to be some of its forgiving features these days. It's many things really. The extension to an hour, the format getting quite stale but I really think it was the time shift. I would say The Chase could be there in another five years if they don't move it or fiddle with the format. Deal was fine. Viewing figures declined when overall viewing figures declined due to online TV services and such, and they saw that as a call to change the format, when they really shouldn't have. I hate Noel's emotional downing of players though. People develop good boards and he seems to just talk them down and try and make them emotional these days to induce a deal, it drags the whole mood of the show down. That's certainly the major factor for me, given what I've witnessed in the last 12 months. Posted: Thu Jan 21, 2016 3:17 am Author: daniel123 Post subject: Re: What killed DoND? Posted: Thu Jan 21, 2016 11:01 am Author: BankerSpanker Post subject: Re: What killed DoND? The over-abundance of gimmicks and the show being moved to a silly time slot. After today's game I'd add cautious players and padding. Posted: Thu Jan 21, 2016 5:15 pm Author: psychokiller Post subject: Re: What killed DoND? To be fair, didn't the move to the coffee+biscuit time slot happen after the final recordings? It was already game over at this point. Too gimmicky, ran for too long, went stale. Posted: Sun Jan 24, 2016 1:45 pm Author: Dizdazdoz Post subject: Re: What killed DoND? 45 mins was ideal length of time for the show, since moving to 1hr you know 99% of the time when player will deal due to when adverts are etc. The button, box 23 etc just stupid, seems it was maybe an idea when the knew they had messed up making the show 1 hour long. Personally don't mind the breaks for racing etc, would like to know how many shows they have per year say 220, and it's planned. I recall going to watch TY play and a fella from Newcastle who's name escapes me (Peed on bedroom carpet). When it was being filmed they could tell you the date months in advance when it would be aired, unsure whether they still can/do. 1 gimmick from memory when the done some special shows I did like was the timer, I would use a twist, give the player as an example 8 minutes thinking time, clock starts once banker makes offer, makes for quickfire thinking early on to save time for later. Sadly it's all to late, the people who make decisions like this dont normally listen to what viewers want, deal worked in the early days as it was easy to play, the only thought was is that enough money for me. Tea time TV should be easy viewing, once you complicate it it's harder to follow. Posted: Mon Feb 01, 2016 12:09 am Author: johnr Post subject: Re: What killed DoND? I got in from the pub last night and had Challenge on at 2am who just so happened to be showing the Christmas shows from 2008. £70k Patricia followed by £1 Orry back to back. I couldn't believe how much they had me interested even though I had seen them before. No offer button, box 23 or hour long business. A small Christmas twist at 5 box that was actually a game changer and it basically summed up exactly what used to make DOND so so good! Posted: Mon Feb 01, 2016 9:44 am Author: JamesJMH91 Post subject: Re: What killed DoND? Posted: Wed Feb 17, 2016 1:18 pm Author: mr_northern_guy Post subject: Re: What killed DoND? Thought this topic would be the most appropriate place to put this. Is it just me, or does DoND feel less "human" nowadays? For example, recently, after the game has concluded, there's been no "What will £x,000 do for you?" like there was when I started watching. Posted: Sun Feb 21, 2016 2:54 am Author: psychokiller Post subject: Re: What killed DoND? That probably stopped when the recession games were recorded around 2008. Posted: Tue May 17, 2016 9:49 am Author: JamesJMH91 Post subject: Re: What killed DoND? To be fair, i think they should really just get the show over with ASAP and i don't think it's really doing itself any favours by taking a break until late October (!) to air the final 40+ episodes before finishing for good. I kind of think it'd be better if DoND never comes back and they just leave it at David's game, his game had a very sweet victory so that'd be a nice enough way to end the series. Posted: Sat Aug 20, 2016 1:12 pm Author: thundercat Post subject: Re: What killed DoND? I would say they have killed the game for the loyal viewers through tampering with it in various ways over the year and killed it for the casual viewer with leaving it too stale - a difficult position for the production as which is the way forward? I agree with Aaron Brocks conclusion in that gimmicks and sob stories were a big issue about 2007 time onwards and certainly lowered the games appeal - something also controlled by the production as they get the pick of the bunch when it comes to applicants. They (mostly) picked the emotionally exposed people, and those with targets for sentimental reasons - it saves the production money when they deal for £7,000 as nothing will hurt the endemol coffers more than a large box win. This way of thinking saved them money but cost them viewers. Posted: Fri Sep 30, 2016 12:51 am Author: JamesJMH91 Post subject: Re: What killed DoND? I agree that the sob-stories and the increasing amount of gimmicks over the years led to DoND's downhill slide. But like Aaron says, at least back in 2009, at least the show wasn't stretched out back then to include useless padding and was still fairly watchable in 2009 despite there being quite a lot of gimmicks. 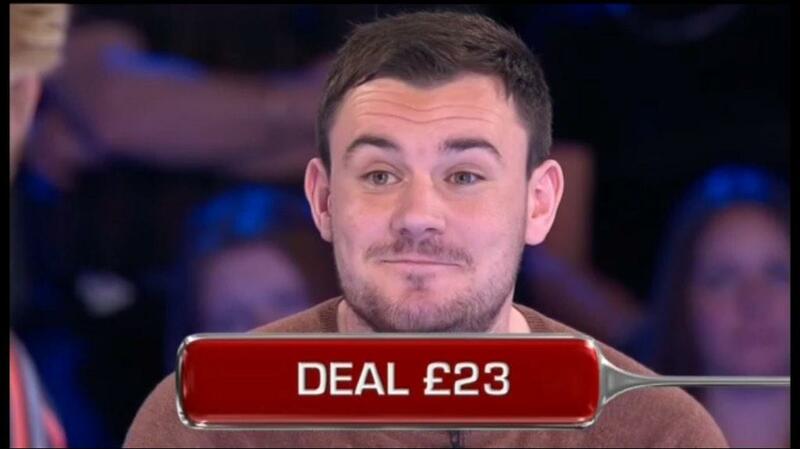 Noel: "£20,000, Deal Or No Deal?" Posted: Sat Oct 01, 2016 1:17 pm Author: johnr Post subject: Re: What killed DoND? Box 23 started to kill the show, the idea itself was fine 'try and create a feel good ending for low money winners' but Noel just kept going on and on and on and on and on about it for half the show just to fill time and then 'the banker HAS to consider Box 23 when making this offer!' erm not really! Then the Offer Button was another pointless extra tweak towards the end, again the idea had potential but it was totally ruined by the fact the games where it might have been quite interesting to have it in play didn't even need it in play as the banker would be sure to telephone with his 'extra offers' to try and stop the player anyway! Again, more filler getting the contestants to get the wings to help them predict the offer! But just like Millionaire the main downfall was the continual conveyor belt of as Mark would put it extremely cautious x unlimitied not even 0.01% brave MASSIVE REGRET players! A classic example being Ann and Tim during double trouble week! Posted: Mon Oct 17, 2016 10:19 pm Author: Brick Post subject: Re: What killed DoND? Adding to what everyone else has said, I'd say the falling ratings - which the show would have struggled to maintain after all this time anyway - led to it being moved to an earlier slot, a la Countdown, then the producers realising it's difficult to justify having a show with that prize budget (£10k is a jackpot win in most other game shows, here it's a below-average one! ), with that number of viewers, on in that kind of slot... All of which probably played a role in the show's downfall. Just with they'd bothered telling us sooner that it was being axed rather than leaving everything hanging in the balance for a year or more. Can't have been good for the crew, contestants or Noel. Posted: Tue Oct 18, 2016 1:04 am Author: psychokiller Post subject: Re: What killed DoND? Oh, they knew. For sure. Not for nothing did Tidybeard pack up his mansion and the crew would have had plenty of notice. Perhaps the contestants were cushioned, but everyone else knew the ship had docked. The show simply lost its freshness, it was going to rot no matter what, even if it hadn't changed a bit since 2006. It was *always* ripe for piss taking. Many of the show's criticisms were as valid in 2006 as they were ten years later. I've re-watched 'golden era' shows recently and it's helped knock the rose tinted glasses off my head. What people describe as ''too much messing about'' existed back then, just that less of it made the edit. 'Characters' more often than not cringed the kidney-wiper off you, young dears telling old dears just how much they'd miss them and how they'd shut themselves off from the world if you went away with less than a grand, people using their mind to determine what amounts lay in what boxes. Its merits stretch as far as its magnetising addiction (simple premise that was effective, can never knock that) and the fact the contestants were occasionally quite fit, and would be on your screen for up to 3-4 weeks. Posted: Tue Oct 18, 2016 9:43 am Author: BankerSpanker Post subject: Re: What killed DoND? It didn't help that show was put in ridiculous time slots. Not many people would've been watching at 1:10PM and I think I remember there being one show on at 11:50AM! Posted: Fri Aug 25, 2017 6:34 am Author: JamesJMH91 Post subject: Re: What killed DoND? Posted: Wed Feb 07, 2018 9:00 am Author: JamesJMH91 Post subject: Re: What killed DoND?